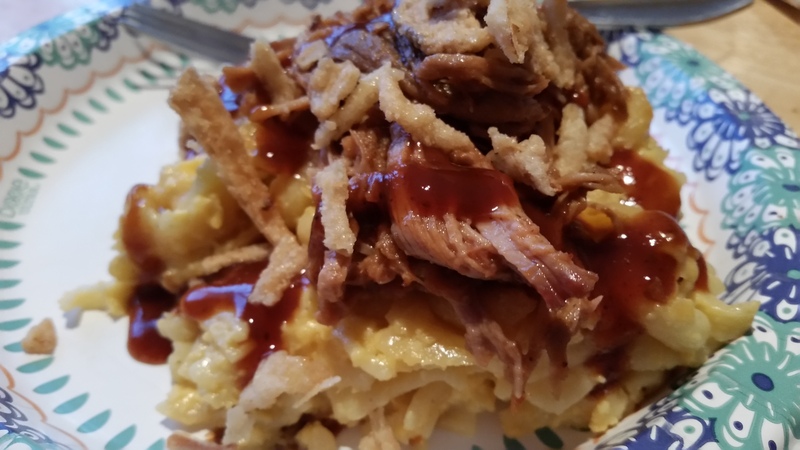 Southern Macaroni and Cheese with Pulled Pork BBQ – What's for Dinner Moms? Don’t you love my fine paper china? This is where my life is this week. The simpler the better. Just keeping it real. My son’s musical had a fundraiser to help defray the costs of the costumes and sets for their show “The Wizard of Oz.” A local barbecue place sold 1 lb. packages of smoked pork or chicken with barbecue sauce for $10 and then the musical got $4.00 of the cost as profit. So, we had 3 lbs of meat to eat and freeze. We love macaroni and cheese. It is the favorite of our house. I hate to admit this and I am loath to suggest this but Velveeta is the secret to the perfect Southern baked macaroni and cheese. We love the custard style macaroni and cheese and Velveeta adds just the perfect amount of creaminess to the dish. Both of my kids were extremely skeptical when they saw me buying Velveeta. Neither one of them likes the flavor or texture so it took a bit of convincing to get them to try it. When I told them I was adding real cheese to the dish and they wouldn’t taste the Velveeta they agreed. They loved it! The extra cheese added enough flavor for them and the Velveeta added the creaminess. Yes! Will I make my macaroni and cheese this way all the time? Probably not but it was good! In a large pot boil pasta according to package directions. You want it slightly Al dente. Drain pasta in strainer and immediately return to pan. Add butter, Velveeta, and the cheeses to the hot pasta. Stir until all is melted. You may need to turn the burner on for a few minutes to help melt the ingredients. Be careful to stir continuously and not burn it. Once ingredients are thoroughly mixed and melted remove pan from heat add half and half, flour, salt, and pepper. Stir well. Add beaten eggs to the pan and stir completely through. Pour into prepared casserole dish. Bake 45-50 minutes until top is slightly browning and center is set. Allow to rest 5 minutes before cutting and serving. 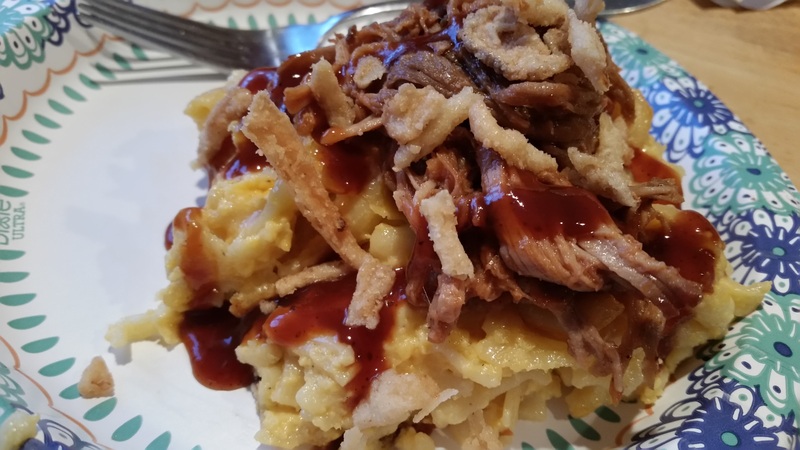 While macaroni and cheese is resting heat pork and BBQ sauce on stove top or in microwave. Serve over macaroni and cheese with an extra drizzle of BBQ sauce and a sprinkle of fried onion strips. This looks really good. Thanks for sharing. Macaroni and cheese always goes well with pork. We use paper plates all the time! This looks so good. Will have to give it a try. Thank you! I am watching son make an “after school snack” of the little remaining piece now. It was so good! Yummy! And you know you can’t make a proper Queso dip without Velveeta! Sometimes you have to confess the “secret ingredient”. Thank you! Lol, no matter what it is!